Aluminum Baking Molds are excellent at providing heat distribution for even baking on all sides of the mold, is light to handle and is relatively inexpensive compared to other materials. 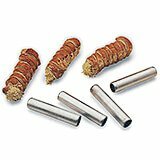 Make the perfect cannoli shells with these cannoli forms. Aluminum tube. Cannoli dough is rolled and fried or baked around this simple form. Pack of 6. Measurements: 1" Diam. x 4 3/4" L. Weight: 7 oz. 3.88" X 1.13" X 1.38"
This Paderno World Cuisine 1 ounce aluminum Dariole/Baba molds (set of ten) are used for shaping food as well as creating eggs in aspic, mousse and layered servings. Also known as dariole, aspic or timbale molds. Material: Aluminum.Capacity: 0.03 Qt. 3.88" X 1.5" X 1.75"
This Paderno World Cuisine 2 ounce aluminum Dariole/Baba molds (set of ten) are used for shaping food as well as creating eggs in aspic, mousse and layered servings. Also known as dariole, aspic or timbale molds. Material: Aluminum.Capacity: 0.06 Qt. 3.88" X 2" X 2.13"
This Paderno World Cuisine 3 ounce aluminum Dariole/Baba molds (set of ten) are used for shaping food as well as creating eggs in aspic, mousse and layered servings. Also known as dariole, aspic or timbale molds. 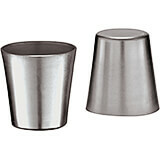 Material: Aluminum.Capacity: 0.09 Qt. 3.88" X 2.38" X 2.38"
This Paderno World Cuisine 4 ounce aluminum Dariole/Baba molds (set of ten) are used for shaping food as well as creating eggs in aspic, mousse and layered servings. Also known as dariole, aspic or timbale molds. Material: Aluminum.Capacity: 0.13 Qt. 3.88" X 2.75" X 2.75"
This Paderno World Cuisine 8 ounce aluminum Dariole/Baba molds (set of ten) are used for shaping food as well as creating eggs in aspic, mousse and layered servings. Also known as dariole, aspic or timbale molds. Material: Aluminum.Capacity: 0.25 Qt. 3.88" X 3.13" X 3.13"
This Paderno World Cuisine 10 ounce aluminum Dariole/Baba molds (set of ten) are used for shaping food as well as creating eggs in aspic, mousse and layered servings. Also known as dariole, aspic or timbale molds. Material: Aluminum.Capacity: 0.31 Qt. 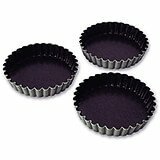 Exal® Brioche Nonstick Mold - 10 Ridges.These baking molds are great to make Brioche bread or any other pastry that is formed and baked in a fluted round, flared pan. Made of aluminum with a multi-layered nonstick surface for better heat distribution and a perfect rust free mold. Dishwasher safe. Pack of 6. Measurements: 3 1/8" Diam. x 1 1/4" H. Weight: 7 oz. Exal® Brioche Nonstick Mold - 10 Ridges.These baking molds are great to make Brioche bread or any other pastry that is formed and baked in a fluted round, flared pan. Made of aluminum with a multi-layered nonstick surface for better heat distribution and a perfect rust free mold. Dishwasher safe. Pack of 6. Measurements: 3 1/2" Diam. x 1 1/4" H. Weight: 6 oz. 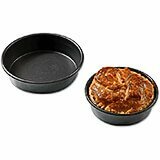 Aluminum Exal Non-stick Baking Mold, 10 Ridges, 4"
Exal® Brioche Nonstick Mold - 10 Ridges.These baking molds are great to make Brioche bread or any other pastry that is formed and baked in a fluted round, flared pan. Made of aluminum with a multi-layered nonstick surface for better heat distribution and a perfect rust free mold. Dishwasher safe. Sold Individually. Measurements: 4" Diam. x 1 3/8" H. Weight: 1 oz. Aluminum Non-stick Plain pan. Exal®: Thick aluminum with a multi-layer nonstick coating inside and enameled outside. Cutter not included. Pack of 12. Measurements: 4" Diam. x 1 5/8" H. Weight: 1 lb. 2 oz. Aluminum Non-stick Fluted Tart Pan. Thick aluminum with a multi-layer nonstick coating inside and enameled outside. Flan or quiche fluted (small wave) Tart Pan. Pack of 12. Measurements: 3 3/8" Diam. x 5/8" H. Weight: 12 oz. 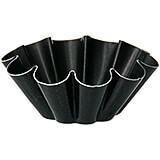 Aluminum Non-stick Fluted Tart Pan. Thick aluminum with a multi-layer nonstick coating inside and enameled outside. Flan or quiche fluted (small wave) Tart Pan. Pack of 6. Measurements: 4 1/8" Diam. x 3/4" H. Weight: 9 oz. A Canele is a small, tall cylindrical shape cake with fluted sides, use this mold to make Caneles or any other pastry with this shape. Temperature range from -4° to 446° F. (-20° to + 230°C.) Aluminum Non-stick Canele Mold. Thick aluminum with a multi-layer nonstick coating inside and enameled outside. Pack of 6. Measurements: 1 1/3" Diam. x 1 1/3" H. Weight: 11 oz. 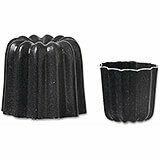 A Canele is a small, tall cylindrical shape cake with fluted sides, use this mold to make Caneles or any other pastry with this shape. Temperature range from -4° to 446° F. (-20° to + 230°C.) Aluminum Non-stick Canele Mold. Thick aluminum with a multi-layer nonstick coating inside and enameled outside. Pack of 6. Measurements: 2 1/2" Diam. x 2 1/2" H. Weight: 15 oz. Black, Aluminum Exal Non-stick, Deep Cake Pan, 4"
Exal® Plain High-side Cake Nonstick Mold. Thick aluminum with a multi-layer nonstick coating inside and enameled outside. Measurements: 4" Diam. x 1 3/16" H. Weight: 2 oz.